Comment: Finally arrived: Peter Torraca's precision-cut light blue topaz from the USA. No inclusions, near 100% brilliancy, all-natural non-radiated super topaz. This gem represents the very best the trade has to offer: from sourcing and cutting to certification, everything was done at top-level, regardless of cost or time. 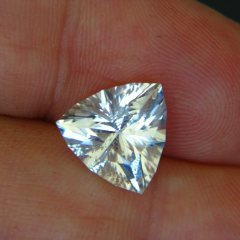 The result is what we constantly aim for: The very best untreated gemstones in the world. 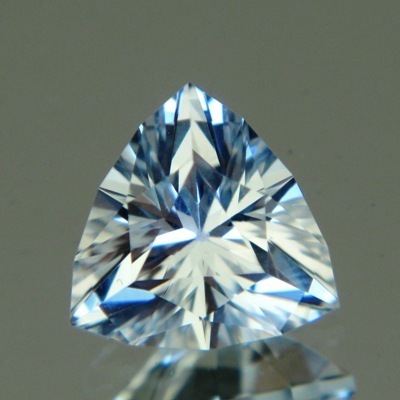 This 5.00 carat trillion sparkles with an ethereal light blue, always visible but not dominant (images mix background reflection of blue sky). AGL certified with "no enhancement" and "commonly not treated". See the rough with its colour zone on Peter's image. Set in platinum (which it deserves) this gem will make a world-class jewel.